San Diego State University has among the lowest fees in the nation for a major four-year public university and graduate fees are also low, particularly when compared to peer institutions across the country. 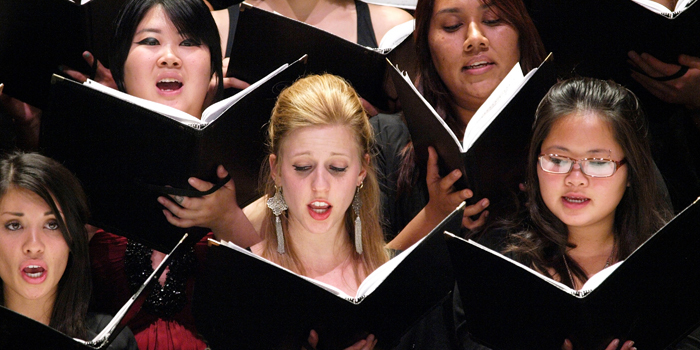 Unlike many programs, SDSU music majors do not pay additional fees for private lesson instruction. An SDSU degree is that rare combination of quality and affordability! View information on the current San Diego State University fee structure. Non-California residents pay an additional nonresident tuition. It is possible for graduate students to obtain California residency, however residency requirements must be fulfilled during the first year in attendance. A significant percentage of Music and Dance students receive financial assistance to pursue their studies. Scholarships are highly competitive and award amounts vary, depending upon the level of need, available funding, and specific requirements. The Giavanna Kersulis Memorial Endowment is intended to provide career development scholarship awards for music students majoring in a performance degree program in the SDSU School of Music and Dance. Career development assistance may include funding for travel, publicity fees, recording costs, etc. Eligible applicants must be currently enrolled as a Performance Major (Classical or Jazz) in the B.M., M.M. or Artist Diploma programs. Additionally, Undergraduates must be enrolled full time and Graduate/Artist Diploma candidates must be enrolled in at least 6 units at time of award presentation. Click for more information and application. Submit completed application (hardcopy) to the main music office to be placed in Dr. Todd Rewoldt’s mailbox. The Kiwanis Scholar award is intended to encourage and stimulate new thoughts, insights, and ideas in music or dance. It is awarded to music or dance majors, allowing for students to realize a project or worthy creative/scholarly activity that may not have been possible due to financial restrictions. The award may be used for, but is not limited to: international travel and research, collaborative performance, travel to attend or participate in a conference, master classes, implement an entrepreneurial project or to build, purchase or rent equipment, etc. Eligibility: All full-time majors pursuing a degree in the School of Music and Dance are eligible to apply for this award. The award carries a maximum value of $750 and will be reflected in the student’s financial aid/scholarship account. For graduate or artist diploma students, full time status shall be defined as enrollment in 6 or more units each semester. For undergraduate students, full time status shall be defined as enrollment in 12 or more units each semester. Click for more information and application. Dance: Scholarships in dance are limited and are based upon the recommendation of faculty. Music: Music scholarships are allocated based upon performance ability, program need and evidence of academic success as determined by the faculty through the audition process. Undergraduate and graduate students are both eligible for talent-based awards. All scholarships are renewable if a student maintains the required grade point average, is making progress in an appropriate degree program and fulfilling all conditions of the scholarship including units completed each semester. Additional SDSU scholarships are available by application and qualifications vary depending upon the funding source. Visit the Office of Financial Aid and Scholarships website for additional information. In order to receive full consideration for a wide range of financial assistance such as work-study, Cal Grants, loans etc., students are strongly encouraged to complete the FAFSA as soon after January 1 as possible. Graduate students interested in being considered for a graduate assistant assignment or teaching position should include such information in their application packet to the School of Music and Dance. A resume outlining work experience, special skills, and any teaching experience is useful to the graduate committee in making determinations regarding such awards to incoming graduate students.